I hope you've already joined the Stampin Out Alzheimer's site! I'm having tons of fun working on the challenges! 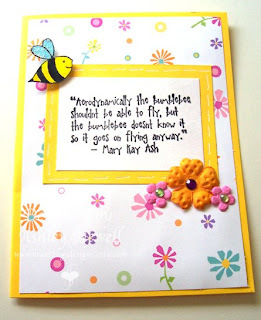 I made yet another card for the Any Winged Thing challenge issued by my friend Katie Cotton. This is the Buggy Sayings set from Paper Makeup Stamps. I love the quotes on this set! That Mary Kay Ash was quite a genius. I used to sell Mary Kay a LONG time ago and I've heard quite a few quotes from her. She's a smart lady! Simple card. Quote, bee, flowers, faux stitch, Stickles and done. I have so many SOA challenges I want to work on and just no time this week. This is absolutely adorable!!! FAntastic job! So cute! I've been eyeing that set for a while from PMS. Beautiful card. I need to check out the challenges... I gave but didn't get any more info on it. Hmmm.